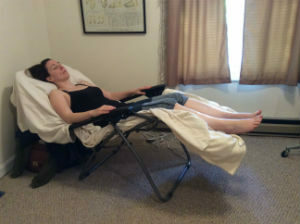 A Community Clinic patient relaxing in a zero gravity chair. Community acupuncture consists of a group of people receiving acupuncture treatments at the same time in a room. 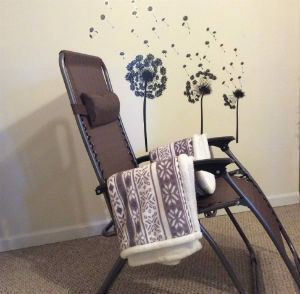 TVA uses comfortable zero gravity chairs, the client wears loose clothing so the acupuncturist can treat points from the knee and down, also from the elbow and down, on shoulders, neck and scalp area. The first time patient often wonders how it feels to sit and relax, possibly fall asleep, in a room with strangers. All doubts typically disappears after the first treatment. Experiencing the shared energy in the room where other people are getting treated is powerful. Compare the community clinic experience to practicing yoga at home with taking a class and immersing in the shared energy among the other participants. Let’s learn from the dandelion: JUST LET GO OF WHAT DOES NOT SERVE US WELL. In an one-on-one appointment with the acupuncturist the treatment is timed in order to keep a schedule, but in the community clinic the treatment is allowed to continue until the patient feels ‘done’. It is difficult to explain the feeling, but every person learns quickly to recognize the feeling. The sliding fee scale is a way to invite anyone in need of acupuncture for treatments. Everybody are expected to pay for their treatments, but only as much as they are comfortable with. It works through a honor system. The payment is placed privately in a lockbox. Since the patient pays for the treatment to his/her comfort level, more frequent treatments can also be an option. The frequency of treatments is often the deciding factor of how fast a problem resolves.